The basic concept behind space tethers is not very complicated. Simply put, space tethers are long cables that connect spacecraft to other spacecraft or to objects such as spent rocket stages, asteroids, or even the planet Earth. When two things are connected by a tether, manipulating one object will influence the other; if we pull on one end of the cable, the spacecraft on the other end will also move. By connecting two spacecraft with a tether, we can force them to stay together and orbit Earth as one single system. Even though objects in orbit are flying around in microgravity conditions, spacecraft in different orbits will turn around a planet or the Sun at different speeds. If we connect two such satellites with a tether, they will each try to go their own way and pull on the cable. The forces on such a tether in space can be very powerful; therefore, space tethers are usually made of thin strands of high-strength fibers. If electricity has to flow through them, conducting wires are also incorporated. There are many types and applications of tether systems; as we will see, the possibilities for this novel technology are amazing. In this chapter the main types of space tethers are introduced, as a basis for the more detailed descriptions of concepts and missions in later chapters. 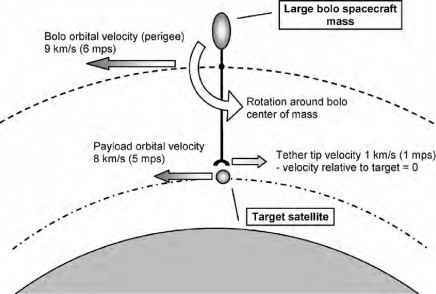 However, as most tether applications have something to do with satellite orbits, we first need to understand how orbital mechanics work.